A Miracle of Science: Cybernetics! Automation! Remote control! Robots! Mad scientists can be cranky. Their assistants shouldn't be. It's not in the job description. You may recognize the area in which Chaucer is floating as the submarine embarkation chamber from page 351. He's looking over the documentation necessary for the day-to-day functioning of Haas' world conquest machine. Who knew that conquering the world was so much work? You may recognize my patented "aim the 'camera' upwards to avoid having to draw ground clutter" technique. It's served me well. Also Chaucer should perhaps be a bit cautious since at least several dozen of him could comfortably fit inside that gun. 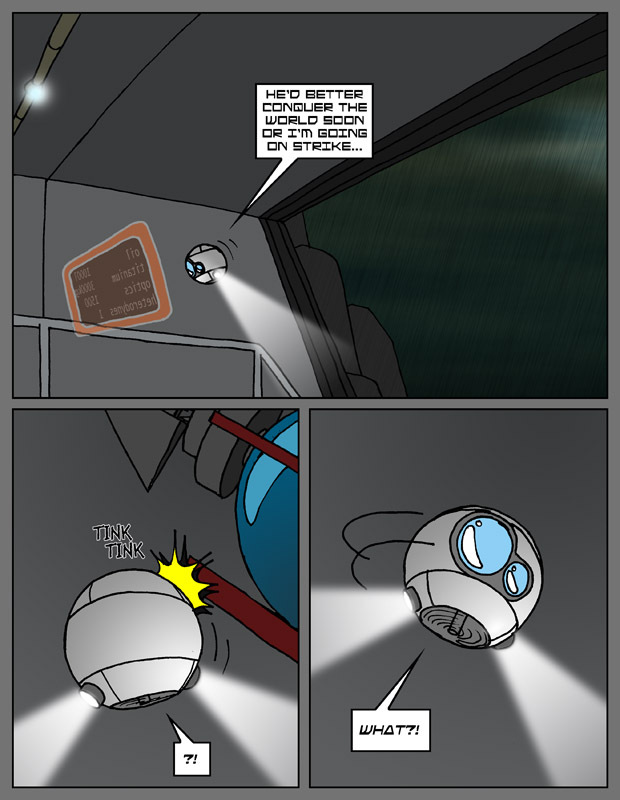 Today's comic link is Malfunction Junction. Why? Because I like it is why. Finally, I should note in the interests of honesty that things are crazy at work right now with E3 bearing down on us, so I can't quite promise an update on Thursday. But I'll do my best.